The schedule at the Stitch Lab is bursting at the seams with loads of new classes and fantastic new guest instructors. There are some really awesome opportunities for learning everything from how to sew an adorable drawstring dress, to making amazing hats and baby slings. We're even starting to offer knitting! Hurrah! All your crafty bases are covered. I'm still teaching hand embroidery, and there are still a few spots open in my upcoming classes. I'm really excited to be offering a special mother/child class during Mother's Day Weekend. It will be a fun opportunity for moms and their kids to learn to stitch together. (looks like it's already full, but sign up to be on the wait list if you'd like!) 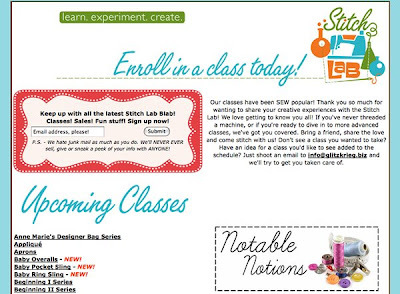 Be sure to check out the schedule page of the Stitch Lab for all the class listings and for more information. And, if you've already taken my hand embroidery class at the Stitch Lab, and are looking for a way to grow your stitchery in a more artistic way, definitely check out Kat McTee's Artistic Embroidery classes at Studio 1408. You know Kat from my raves about her Screen Printing and Surface Design classes, but what you may not have realized is that she's also an amazing embroidress. 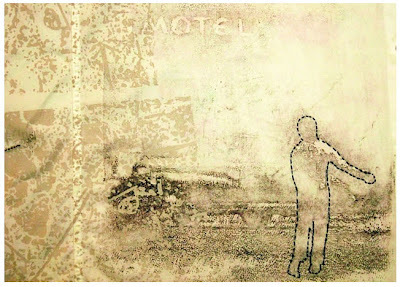 She's created some amazing pieces of art that combine her surface design and embroidery. 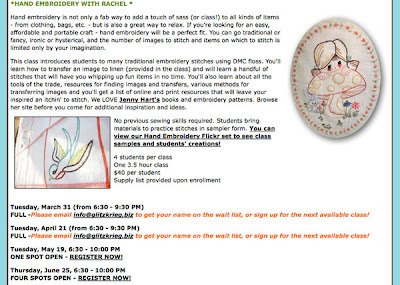 I'm dying to take her artistic embroidery class soon. My friend, Victoria, who was also in our surface design class, took the artistic embroidery class and said it was amazing. Amazing amazing amazing amazing. I can't say it enough. Taking craft class is the best way to learn a new skill and to force yourself to make time to work on the new skill. I can't tell you how many times I've been in a class and more than one student comments on how they wouldn't have taken the time to craft if it weren't for the class. Go make time for a crafty class now! I so ooo wish I lived near you ! I really would love to have some of these lovely wonderful, crafty classes.. with classy women.. I am so excited to be a part of Stitch Lab! This spring and summer is going to get real crafty, real fast. I'd love to take some classes - but I don't live in Austin - not even in Texas for that matter (please don't hold it against me :D) Would be so awesome to have the opportunity to learn from ya'll! Maybe one day in the future, there will be video online classes.. that would rock! oooh I want to take a class! I have always wanted to get more into hand embroidery!